A B.C. 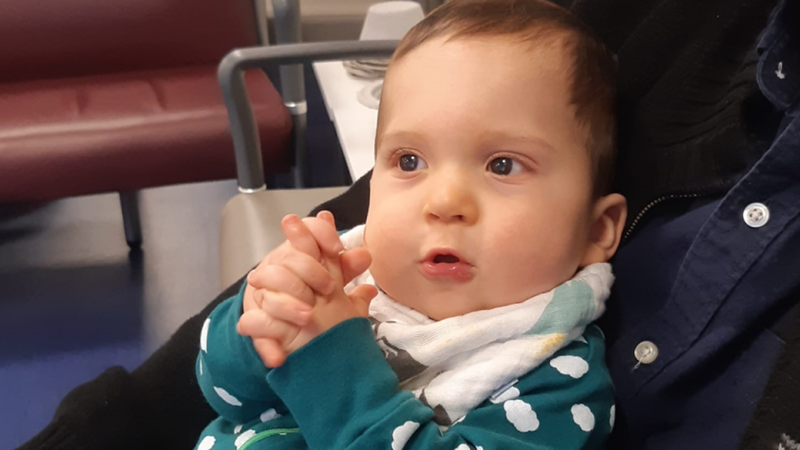 mother is frustrated and frightened after learning her vulnerable baby boy may have been exposed to measles, forcing the family to keep him under quarantine at their Burnaby home. Stefania Seccia’s son, Max, was born premature at BC Children's Hospital last year, and is considered high-risk after having to undergo surgery for an abdominal blockage. Last Friday, Seccia learned Max, who is too young to be vaccinated for measles, may have come in contact with a child who had the disease during a return visit to Children’s in early February. "I had to pick my jaw up off the floor," Seccia said. "I thought it was, like, a prank. And he has to stay in isolation until Saturday." Max, whose first birthday is Tuesday, has to stay inside the couple’s home for a week, without any outside visitors, in case he did contract measles and is contagious. “We are absolutely infuriated," Seccia said. "It's surreal that in 2019 my son can’t see family, can’t go outside on his first birthday because we just happen to be in the wrong place at the wrong time." Because of Max’s health issues, getting measles could have serious implications. The family's ordeal comes just days after Vancouver health officials announced the latest measles outbreak in the city. As of Friday, there had been nine confirmed cases in recent weeks. The outbreak has also turned the spotlight back on the controversial anti-vaxxer movement. As of Monday, a Change.org petition to Premier John Horgan asking that vaccines be made mandatory had more than 27,000 signatures. Seccia thinks childhood vaccination should be mandatory, and will be re-scheduling Max’s appointment as soon as he’s out of isolation. Measles is highly infectious. It spreads through the air and can linger in a room for hours after an infected person has left the space. It can also be spread through sharing food and drinks and kissing. In the days that follow, a rash spreads from the face to the chest, but by that point, they've already been contagious for as many four days. Patients remain contagious for four days after the rash starts. While measles patients simply require rest and fluids, infection can lead to complications such as pneumonia, inflammation of the brain, deafness, seizures and even death.